Book Review: 'The Club,' By Takis Würger German author Takis Würger's debut novel, a thriller about a secret society at Cambridge University, also tackles hot-button issues of privilege and toxic masculinity. It's now out in English. It's hard to believe that things could get much worse for young Hans, the protagonist of The Club. As the book opens, the German boy recounts his childhood in a house in a forest, the awkward son of two loving parents. In short order, his father is killed in a car crash, and his mother dies of an allergic reaction to a bee sting. His only living relative has no interest in raising him, so he's sent to a Catholic boarding school where he's teased by his new schoolmates. These are the first clues that The Club, the debut novel from German writer Takis Würger, is going to be a dark one. The book, a bestseller in Europe and now translated into English by Charlotte Collins, tackles hot-button issues of privilege and toxic masculinity, to mixed results. As a thriller, it's competent; as a literary novel, it's well-meaning but underwhelming. The beginning of The Club finds Hans trying to navigate life without his parents. He's a talented but unpopular child: "I don't know if I was a nerd; if I was, I didn't care," he declares. The deaths of his parents have laid him low, and he's mired in a stubborn melancholy throughout his teen years: "For a few days I waited to wake up from this nightmare, and when that didn't happen I became filled with a darkness so overwhelming I'm astonished that I survived." Hans only has one family member left: his aunt Alex, an eccentric art professor living in England. She has her own demons, the result of a years-long battle with depression, and she doesn't want her nephew to become drawn into her dark world: "I had to vanquish it alone. If I'd taken Hans in I would have destroyed us both. The dark thoughts would have infected him." But when Hans graduates from his boarding school, his aunt offers to get him into Cambridge University, where she teaches, on one condition: that he infiltrate a secret society called the Pitt Club, which she describes as "a club for young men here at the university who think they're better than everyone else." The Pitt Club counts several student boxers among their number; Alex thinks Hans' skill at pugilism will guarantee him entry. She turns out to be right, and Hans is welcomed into the club with open arms, making friends with Josh, a borderline sociopathic student boxer. Hans periodically checks in with Alex and with her student Charlotte, both of whom nurse mysterious grudges against the club. When Hans learns why the women loathe the club, he's torn between his new friendships, his sense of loyalty to his aunt and the young woman he's developed a crush on. 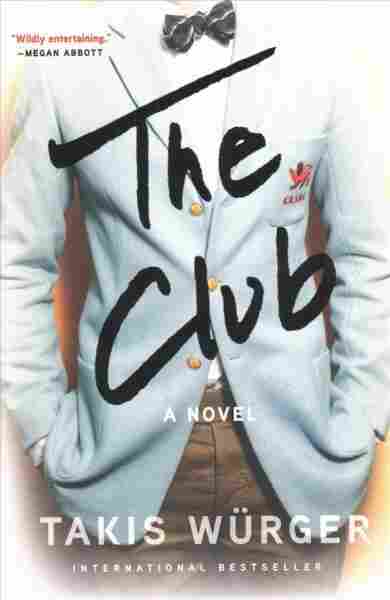 The Club, like any thriller, depends on plot twists for its power, and unfortunately, the plot is pretty predictable. The members of the club are the British equivalent of privileged and drunken frat boys, and nobody who's paid much attention to what happens on college campuses will be shocked by the novel's developments. That's not to say the book isn't readable; it is, and Würger knows how to use his spare prose to build suspense. Sadly, he hasn't put enough thought into character development. Hans is a particularly frustrating character, at one point observing, "Some of the men at the Club had a strange way of talking about women; it sounded as if they despised them. Far stranger to me than these men were the women who knew what they were like yet still came to the parties." Those words — coming from a character who had previously been portrayed as intelligent and sensitive — ring maddeningly false. The Club takes aim at toxic masculinity and sexual violence, but it depends too much on a male character saving the day for the women he's promised to protect. ("I could be strong for both of us until I found out who had hurt her," Hans declares at one point, seemingly oblivious to the cliché.) It's a problem reinforced by the book's startlingly melodramatic conclusion, in which everything is wrapped up way too neatly. You can't fault Würger for being boring, though; he does keep the reader turning the pages, which is harder to do than it might seem. And his critique of gender and class privilege is well-taken — it's great that he's addressing these topics, and his heart is undoubtedly in the right place. He's not by any means an untalented author; it's easy to imagine him writing a more powerful thriller that deals with serious issues. Unfortunately, The Club isn't it.